A ready to use paste that is perfect for simple modelling or life like floral displays. Not quite what you’re looking for? 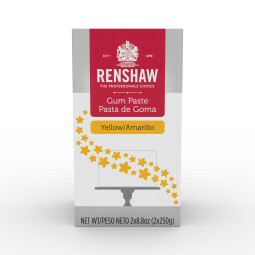 Browse all Renshaw Gum Paste. Break off the amount of Gum paste you require for the project you are working on. Knead the gum paste until it is soft and pliable. Roll out the Gum paste on a surface lightly dusted with cornstarch or powdered sugar to your desired thickness. Cut out the shapes you require. While working with Gum paste ensure you keep the unused paste covered, and protect your cut outs under plastic film to prevent them drying out. Add color by kneading paste food coloring into the gum paste until evenly dispersed. If you are assembling decorations, leave them to dry for 24 hours. When flowers or cut outs are dry, brush them with coloured dust to make them look more realistic. Serving Per container about 14. Serving Size 1.2oz (35g). Store in a cool, dry place away from light. Once opened, wrap any remaining gum paste in foil or polythene to prevent drying. Use product at room temperature. Do not refrigerate or freeze.